Summary: In order to actively expand new business areas, recently, after the approval of the State Administration of Market Supervision and Administration, China Transport Heavy Industry Machinery Co., Ltd. successfully registered and successfully approved the Chinese-headed no regional enterprises. The registered capital of the company is 50 million yuan, and its main business scope includes the manufacture and sale of construction machinery, crane equipment, environmental protection equipment, agricultural machinery and accessories; technical consultation and service of machinery manufacturing; maintenance of machinery and electrical equipment; processing of metal products; manufacture and maintenance of metal containers; automobile and accessories, metal materials, motors, electrical equipment and building materials. Material sales; packaging box manufacturing; import and export of goods and technology business, etc., is a set of heavy machinery and equipment and structural parts product development, manufacturing, sales as one of the modern enterprises. In order to actively expand new business areas, recently, after the approval of the State Administration of Market Supervision and Administration, China Transport Heavy Industry Machinery Co., Ltd. successfully registered and successfully approved the Chinese-headed no regional enterprises. The registered capital of the company is 50 million yuan, and its main business scope includes the manufacture and sale of construction machinery, crane equipment, environmental protection equipment, agricultural machinery and accessories; technical consultation and service of machinery manufacturing; maintenance of machinery and electrical equipment; processing of metal products; manufacture and maintenance of metal containers; automobile and accessories, metal materials, motors, electrical equipment and building materials. Material sales; packaging box manufacturing; import and export of goods and technology business, etc., is a set of heavy machinery and equipment and structural parts product development, manufacturing, sales as one of the modern enterprises. 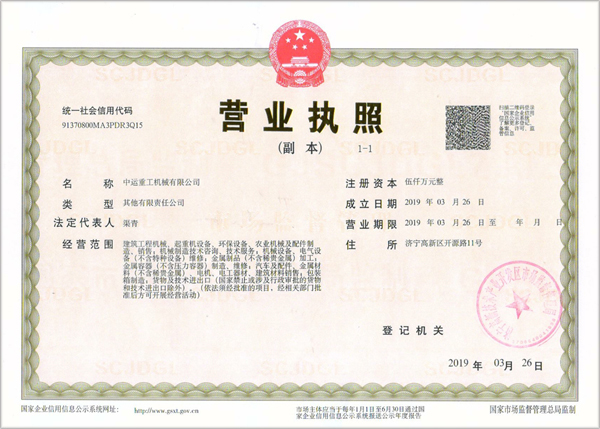 According to the "Measures for the Implementation of Enterprise Name Registration Management" of China, the registered capital of enterprises without regions should not be less than 50 million yuan, and must be strictly examined by the State Administration for Industry and Commerce at all levels before the use of enterprise names without administrative divisions can be made. In theory, there is no clear regional attribute for non-regional enterprises, which is a real combination of multi-capital. From the current development situation of enterprises in some developed countries in the world, it has become an important trend to dilute the regional attribute of enterprises. The establishment of Zhongyun Heavy Industry Machinery Co., Ltd. without regional restrictions, the enterprise will have a broader development space, which is of great significance for the company to expand the global market and enhance brand awareness in the next step! In the future, the company will actively respond to the national development strategy of Made-in-China 2025, vigorously promote intelligent manufacturing, adhere to the road of scientific and technological innovation, constantly innovate marketing models, expand business channels, improve brand building, and make positive contributions to the innovative development of the machinery industry with high-quality products and perfect services.